Richard Williams (left) and Robert Zemeckis on the set of Who Framed Roger Rabbit. 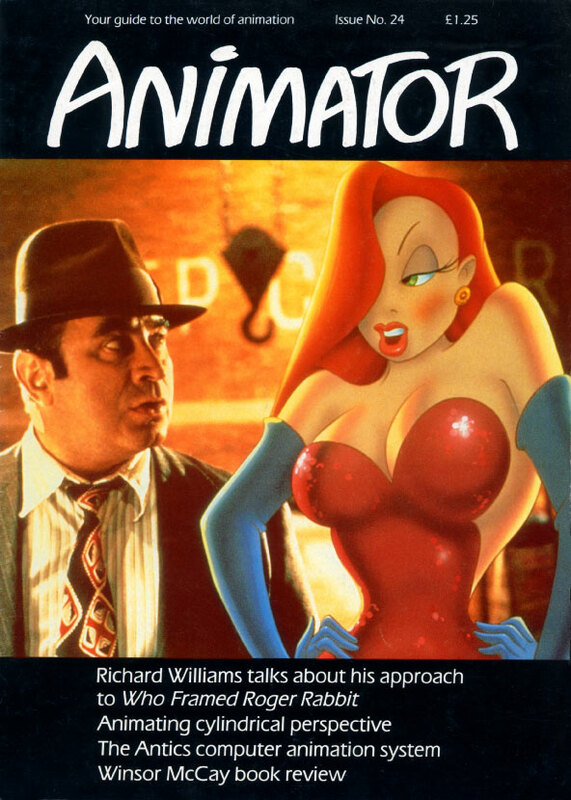 Jeremy Clarke talks to Richard Williams, Director of Animation on Who Framed Roger Rabbit. RICHARD WILLIAMS: The initial feeling I had about the picture was that it would look a bit gimmicky. The problem was how to ensure the cartoons didn’t make the live action look false, and that the live action people didn’t make the cartoons look false. They could vitiate each other, cancel each other out. Like a flat Tony the Tiger surrounded by live-action people. You don’t believe he’s real because he’s surrounded by live action, and you don’t believe the live action’s real because there’s a flat cartoon someone has pasted onto the screen, as if on glass. The front cover features a picture from "Who Framed Roger Rabbit". Click the pic to see a larger version. At my first meeting with Bob Zemeckis (Director) and Steven Spielberg (Executive Producer) we discussed the way these cartoons never interact right with the live-action people. The way to make the thing work, apart from the 3D effect, which we felt we could achieve, was to get the interaction right, because they’re going to be affecting each other physically all the time. Spielberg said, “If the Rabbit sits in a chair, then the chair’s covered in dust and the dust rises from where he sits.” The Rabbit would have a real cup which is rattling all the time. The cartoons and the live-action people would have to be pushing each other, kissing each other, whatever; they are constantly entangled physically, so we used all sorts of puppetry and devices to affect the environment. In fact, in the first hour-and-a-half meeting, which was Bob and I for the first hour, then Steven Spielberg joined us, we had the whole formula worked out, as I recall. Then subsequently we had to do a very elaborate test to prove that we could do it. JEREMY CLARKE: Was this with Bob Hoskins? RW: This was before Bob Hoskins had been cast. It was another actor, just for the test. 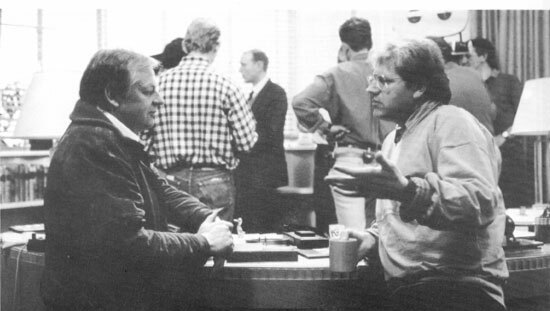 Bob Zemeckis shot it at Industrial Light and Magic with me there. They lit the set for night, it was a back alley with flashing neon lights. We got photostats of each frame and I animated the Rabbit in the hole he left for me. Then we did tonal mattes and the rim lighting stuff. We did not see it combined at that stage, we only saw the pencil drawings with the photostats that we’d shot, and then the colour cels with the photostats. We shipped it all off to ILM and the next thing I heard was when Bob Zemeckis rang me up. He said, “You won’t believe it when you see it. Everything worked. Everything. It’s beyond my wildest expectation. Everyone’s gone ape. I was born to make this movie. “The other thing is that we’ve shipped the tests over to Spielberg in New York, and he says it’s the second time in his life that he’s seen a historic technical breakthrough. The first time was when he saw Lucas’ early tests for Star Wars where they had the rocket ships all looking real.” That was ILM too, of course. The next thing I heard, they showed it to Michael Eisner, who is the creative head of Disney, and Frank Wells who is the business head. Apparently Frank Wells said, “That’s not animation, that’s a guy in a rabbit suit, isn’t it?” It’s that convincing. I can see that if you didn’t know animation you might think that.